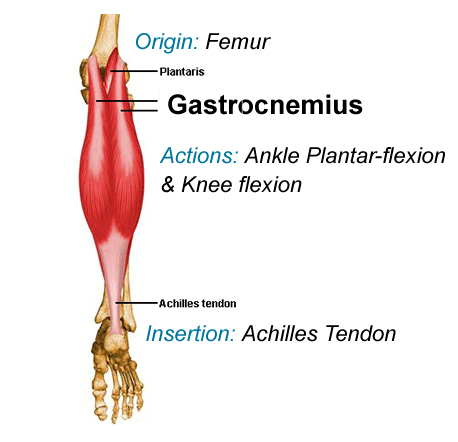 The large muscle mass on the posterior leg is composed mainly of the gastrocnemius and the soleus muscles. Together they form what is known as the ”triceps surae” that attaches to the calcaneal (aka Achilles) tendon. The superficial gastrocnemius has 2 heads and crosses 2 joints, the ankle and the knee. It’s 2 heads emerge from between the hamstring tendons before merging with the calcaneal tendon about halfway down the leg. While it’s name means “belly of the leg” the gastrocnemius heads are actually quite thin compared to the deeper thicker soleus. 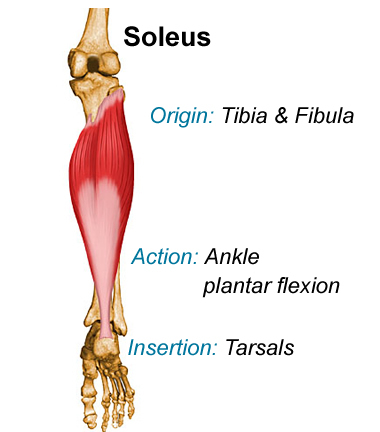 The soleus is deep to the gastrocnemius, though it’s lateral and medial borders bulge from the side of the leg and extends further down the leg before merging with the calcaneal tendon. The soleus is sometimes referred to as the second heart because of the important role its strong contractions play in returning blood from the leg to the heart. So why is the calcaneal tendon referred to as the Achilles tendon? As a baby, the Greek mythological warrior Achilles was dipped in the river Styx by his mother to make him invulnerable. He was completely immersed except for the ankle by which she held him. After fighting the Trojan war Achilles was fatally wounded when an arrow pierced his heel. Thus the term “Achilles heel” refers to a small but fatal weakness. The hamstrings are located on the posterior thigh between the vastus lateralis of the quadriceps and the adductor magnus of the adductor group. While not as powerful as the quadriceps of the anterior thigh they are still powerful hip extensors and knee flexors. All three hamstrings originate at the ischial tuberosity. The long tuberous bellies extend down the thigh before becoming long thin tendons inserting on either side of the posterior knee. 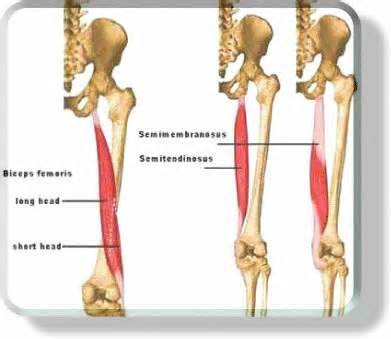 The Biceps Femoris is the lateral hamstring and has 2 heads. The short head that attaches to the linea aspera on the back of the femur and the long head that runs up to the ischial tuberosity. Both heads merge to insert into the head of the fibula. The 2 medial hamstrings are the wider and deeper Semimembranosous, and the more superficial l Semitendinosous. The semimembranosous inserts into the posterior condyle of the tibia while the semitendinosous inserts into the anteromedial tibial condyle via the pes anserinus tendon. And why are they called hamstrings? The term hamstrings originated in 18th century England. Back then butchers would display pig carcasses in their shop windows by hanging them from the long tendons at the back of the knee. The four large quadriceps muscles primarily extend the leg at the knee. The cylindrical superficial rectus femoris is located on the middle anterior thigh and is the only one of the quadriceps that crosses two joints, the hip and the knee. Thus it also flexes the thigh at the hip. Vastus intermedius lies deep to the rectus femoris. Vastus medialis is located on the medial anterior thigh and forms that teardrop shape just above the medial knee. 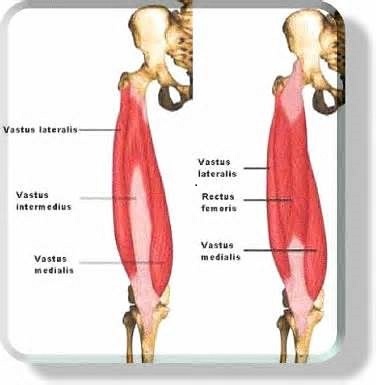 Vastus lateralis is the sole muscle of the lateral thigh. Its posterior edge lies next to the biceps femoris, one of the hamstring muscles. The vastus lateralis lies deep to the iliotibial band and binding of these two structures is one of the causes of iliotibial band syndrome. All four of the quadriceps muscles converge into a single tendon above the knee. The tendon envelopes the patella and attaches to the tibial tuberosity. That is that “bump” on your shin just below your knee.